Every year the village of Altamont, New York has a Christmas Victorian Stroll that showcases the beautiful Victorian houses that dot the streets of Altamont. This year on behalf of SMS Lines Santa arrived via the SMS Lines Christmas Train a new first for Altamont and SMS. After the train arrived children could visit Santa in the attached boxcar and get a treat and there picture taken. Tonight was a first, the first time I can recall shooting a night photo around Rouses Point Station. 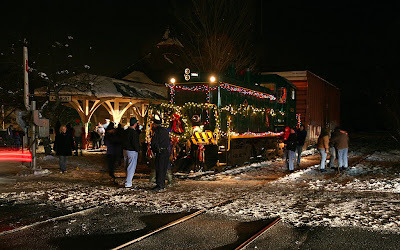 Given the suggestion by Richard and Bonnie Wingler that we take a photo or two of the Holiday Train here before it slipped back across the border until next year, I jumped at the chance to get a second set-up with the train after Westport. The building itself is in pretty rough shape and needs a lot of work, but it still offers a nice frame to use trackside. I arrived first and was testing the lighting when the Winglers pulled in, and we had a happy visit together, highlighted by the arrival by Plattsburgh Cab of the D&H crew for train 930, parked in the siding to our south. Out of the cab emerged engineer Marty Shapiro, who I've known for quite a while. We enjoyed visiting for a few minutes before their cab took them down to the power. 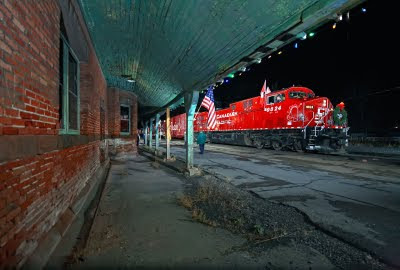 Then it was time for the headline act, CP Rails Holiday Train, to roll in to a stop for its crew change! A sprinkling of people who had chased the train up from Plattsburgh arrived to admire the power. With the Canadian Crew on board, brakes were released and the head end pulled forward into position for my photo! Note the traveling flag from Carrollton, Kentucky in use here to make a nice accent. Walt Favro, who resides a couple blocks away to the south and reports train movements through town for everyone, disappointed us by staying inside rather than joining us trackside. Maybe next year Walt! Shot on November 30, 2009 at 22:46 with the 5D and Nikkor 14 - 24/2.8 lens set at 16mm and f2.8. Please enjoy! Comments are welcomed!